The RSS members have been attending the events organised by Sanatan Sanstha. This is how SS functions. Even though organisations like the RSS have claimed that they have nothing to do with SS, one can see them working hand in hand. The agenda of all these organisations is to establish Hindu Rashtra, and they have mastered the mechanisms to protect themselves and their sister organisations. It is important here to note that banning the organisations is not the solution. It is the ideology that they are determined to spread which has to be dealt with legally and politically. The conspiracy and the agenda of terror of SS and its terrorist activities is no longer hidden. Even though it has always been a public secret, and various demands were made to take an action against the Hindu terrorist organisation, it remained and still remains untouched. The organisation which is registered not as a single entity, but as different units independently, has made it extremely difficult to take legal action against it and thus, it has grown into a mammoth terror outfit in the country. In its recent notice to its seekers (the volunteers, followers or members of SS are addressed as Sadhak in Marathi and Hindi, and as seekers in English by the organisation), the SS in its journal Sanatan Prabhat, said, “If you are afraid of being attacked, then chant the divine name and pray.” The notice, which was an appeal to all the seekers not to be scared, said, “It is very obvious that you, Hindutva loyalists, Dharma Premi and Sadhak would fear that you would also get falsely accused and arrested. Those having such fears should invoke Kuldevta or Lord Krishna or both.” This comes against the backdrop of the reports of the Special Investigation Team (SIT) in Karnataka investigating the murder cases of rationalists M M Kalburgi and Gauri Lankesh. The reports have revealed that all those who are arrested till date are SS seekers. While asking its seekers to chant Kuldevta and Krishna’s name, the organisation continues to chant for a Hindu nation through violence. The brain behind the conspiracy? After five long years and three more political assassinations, involvement of the SS in the killing of Dr. Narendra Dabholkar has been established. The rationalist was shot dead on August 20, 2013 in Pune. The Maharashtra Anti-Terrorism Squad (ATS), following the clues by the SIT, had arrested Vaibhav Raut, Sharad Kalaskar and Sudhanwa Gondhalekar. The ATS, which made the arrests in Nalasopara and Pune on August 10, had recovered about 20 crude bombs, pistols, magazines and explosive material from them. According to a report by IANS, the Maharashtra Anti-Terrorism Squad (ATS) has arrested Avinash Pawar in Mumbai today on August 25, 2018 in the case of hoarding explosives. Following the arrests of the trio earlier, Sachin Andure from Aurangabad was arrested. Kalaskar, during his interrogation, has told ATS that he, along with Aurangabad resident Sachin Andure, shot dead Dabholkar and Virendra Tawade, who was the first suspect in the case, planned the whole conspiracy. It is no longer only the question of the political assassination of rationalists or the assassins, but it is about the brain behind a larger conspiracy in the country. During the course of its investigations, the SIT has recovered two lists containing names of 34 individuals who had publicly condemned Hindutva politics. These lists were put together in July 2016 and were being updated ever since. All those who have been arrested by the SIT till now, are linked to SS and Hindu Janajagruti Samiti (HJS). The SS, which proudly says that they provide the RSS with its missing spiritual outlook, also trains its seekers to use air rifles, and is also known for its extremist ideology of violence. Now that the SIT and ATS have established that the SS is a dangerous outfit, the investigation should not stop at Tawade. He is not alone; he was just a tool of an organisation whose agenda is to establish a Hindu nation by banishing all those who speak against it. 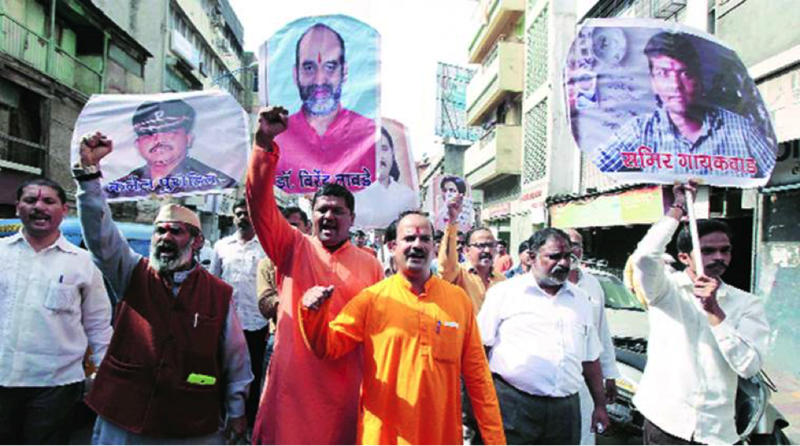 Its founder Jayant Athavale advocates violence and killing – as legitimate tools to establish Hindu Rashtra. The organisation gives a call to, “Destroy evildoers if you have been advised by saints or Gurus to do so. Then these acts are not registered in your name.” Those who oppose the idea of the Hindu Rashtra are the evildoers for the SS. Hence, the organisation spreads terror by wiping out its enemies to realise its dream of establishing a Hindu Rashtra, as it did in the case of Dabholkar, Pansare, Kalburgi and Lankesh. Bangera, who was recently arrested by the SIT in the case of killing of Lankesh, has confessed to have trained Rudra Patil, Akolkar, Pawar (involved in the bomb blasts) and Tawade in using arms. He has further informed the SIT that he had joined a Maharashtra-based organisation in 1997, and its chief had made it compulsory for its members to learn to use arms. Even though he left the organisation in 2009, he stayed in touch with the organisation and that is how he was approached by Amol Kale, from whom, the SIT recovered the lists of the “targets”. Despite all this mounting evidence of involvement in terror activities, the organisation continues to function openly. It has not been placed under any kind of legal restriction, as was done with other organisations which were allegedly involved in murders or bomb blasts. Many feel that it is because of the political patronage that these organisations get. This has fostered a sense of impunity among such criminals across the country. As it is done with any other religious extremist groups, the office bearers, leaders, transactions of the Hindutva organisations functioning in the country should be investigated. A close look at the work of the SS tells us that these organisations make one body together, but function with different names and agendas to ensure that in case of any criminal investigation, the leaders can safely distance themselves from the perpetrators of the crime.